This is a lab-built device which allows mono-crystals of wide band gap dielectric crystals to be grown, with the Bridgman-Stockbarger method, from liquid melts after pulling of the seed crystal at temperatures as high as 15000C. Mono-crystals with dimensions 5 x 0.5 cm have been grown with this device. Good quality wide band gap fluoride dielectric crystals, doped with trivalent rare earth ions, can be developed due to an accurate temperature control during the pulling and cooling stages of the growth process. X-UV (30-110 nm), VUV (110-180 nm), UV (193-350 nm) light sources. (1) X-UV light sources, which emit in the spectral region from 30-110 nm (cut-off wavelength of LiF window). These are stabilized discharge tubes of open geometry, which operate under differential pumping in special configurations. (2) VUV-light sources, which are coherent light sources (157 nm Laser) and incoherent light sources of stabilized discharge tubes of closed geometry operating over a wide spectral range. (3) The UV coherent light sources are excimer and N2 lasers emitting at 193, 248 and 315 nm respectively. The Lambda-Physik LPF 200 molecular fluorine (F2) laser emits at 157nm. The pulse duration is 15 ns at full width at half maximum (FWHM). The maximum repetition rate and output energy are 20 Hz and 55 mJ, respectively. It has the capability of working at 193nm with the appropriate optics. Ultra high vacuum chamber for simulating space conditions. 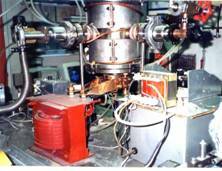 The apparatus is an ultra high vacuum (10-7 mbar) 316 stainless-steel chamber. The samples under investigation are placed on a cold finger at variable temperature (Janis 22C/350C, (8 - 475 K) and at the same time they are irradiated with controllable photon fluxes at selected VUV and X-UV wavelengths. Applications include irradiation of biological samples in vivo to test survival rate in space, and accelerating aging of satellite materials and adhesion and diffusion between interfaces of space surfaces.